Show your support in building a sustainable future with eco friendly products, right in time for Earth Day. Read on to find out more. Show your environmental consciousness by distributing reusable canvas bags for shopping, grocery, or travel. These eco friendly products are effective tools to promote your products and services to people who prefer using this everyday carryall. Choose from various types of reusable totes here at LogoX. The large print area and durability of our material make our bags a great walking advertisement. With a custom bag that’s made from sustainable materials, you state your company’s green goals and show others you are serious about saving the planet. This can inspire your audience to make a similar choice and follow your initiative. Because reusable totes are versatile and used to carry just about anything anywhere, people love to have them as promotional products. When they carry your giveaway, it serves as a brand endorsement to their friends and family who see your bag. These eco friendly products are sustainable writing tools you can customise for an effective marketing strategy. Include your company name or logo to raise awareness about your brand and its message. Pencils are great promotional items because everybody uses them. When they are borrowed, other people get to see your information and learn more about your business. For a low price, you can give hundreds and thousands of them to potential or current customers. And because they are lightweight and small, you can easily distribute them at trade fairs, conferences, and other social events. These are great specialty items for increasing your brand exposure and gaining favour from your prospects. Since your product is associated with the green movement, you convey your message of concern for the environment. This adds value to your investment because it projects an earth-friendly message. Green Movement Definition: A movement that stresses environmentally-friendly practices and initiatives. What’s great about water bottles is they don’t just stay in the kitchen or on someone’s desk. People use these when they drive, jog, bike, or go to the gym. This means it can tap a wider audience and increase your brand awareness faster than other marketing strategies. It also increases the chance for your company to be massively advertised outside the office or home. You can never go wrong with a custom mug because this thoughtful gesture doesn’t get shoved into a drawer or end up in the trash. It is often used and stays out in the open for everyone to see. Because your giveaway is made from U.K. recycled plastic, your business promotes corporate social responsibility and creates a positive impression. You also encourage your recipients to use recyclable products for everyday use. If you want to introduce your brand in a functional and cost-efficient way, go with eco friendly products like these. They are non-chip, have enough space for your name and logo, and also provide a canvas for your message or eco commitment. Made from recycled materials, eco notepads are a great way to inspire recipients to get on board with your ecologically responsible message. You not only give back to the planet but also remind others of the importance of going green. What’s great about notepads is they are used in the home and office. These are highly usable items that rarely leave the desk so you know your brand remains visible. Even if it lays on a desk or table, those who pass by will notice the name and logo, linking them to your environmentally friendly initiative. You not only leave a lasting impression but also remind others of your sustainability goals. These eco friendly products are made either from bottles or papers, making a clear statement to others about your commitment to keeping the environment safe. 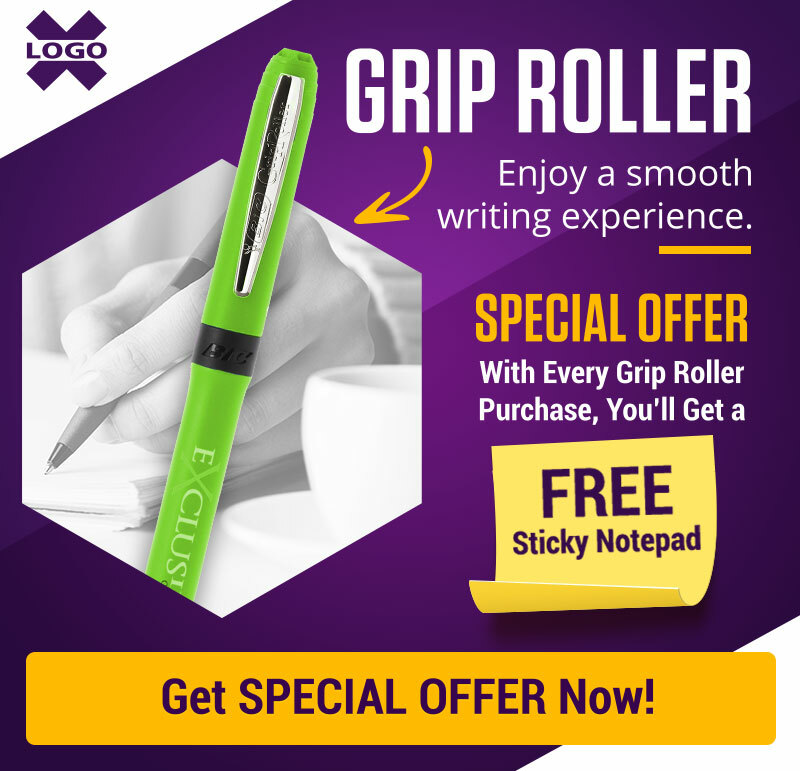 If you are looking for a promotional product that will receive heavy use, an eco pen is what you want. Unlike shirts and magnets, custom pens offer a greater cost per impression. This is because they are used on a regular basis, especially for work and school. Every time it is used, your recipients are exposed to your advertising message. This makes it easier for them to remember your name once the need for your services arises. This is one of the best ways to keep your brand in front of current and potential customers. People always take down notes, and a journal is large enough to contain all your information—your name, logo, slogan, and contact details. Because it is made from recycled paper, your audience knows of your commitment to have little or no impact on the environment. Whenever they use their journal, they associate your company with environmental friendliness. This product is economical to produce, saving your organisation tons of money for advertising. It is also easy to distribute at exhibitions, lectures, and seminars. These green products are small corporate gifts effective for channelling your company’s information and message to the public. There’s always a use for wood coasters because they are handy and convenient. This unique choice of giveaway is a great way to remind your audience you are going green. And because it’s made from wood, it can last for years, unlike other coasters that need to be replaced after several uses. Coasters are often used in social settings, creating dozens of impressions in a short amount of time. They repeatedly catch the eye, with your message sitting directly in front of your customer. Another green promotional item is an organic cotton baseball cap. This sustainable headwear is the perfect giveaway to remind your audience to care for the environment this Earth Day. People wear baseball caps at all times of the year. Because of this, you know your brand will be recognised every time your recipient steps out of his or her house. It’s best to choose a neutral colour that goes well with any coloured shirt. This way, the cap can be worn with any ensemble, putting more attention to your name and message. Take advantage of Earth Day to offer eco friendly products to your customers. Make this day not only for reminding others to pursue ecologically responsible practices but also to promote your brand in the most creative way. Are there other green promotional items we didn’t mention here? Let us know in the comments section below.